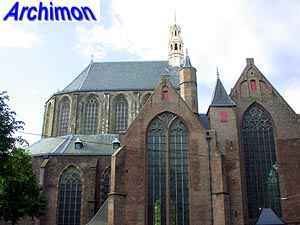 Although The Hague was a village until the 19th century, it did have a parish church large enough for any city to be proud of. 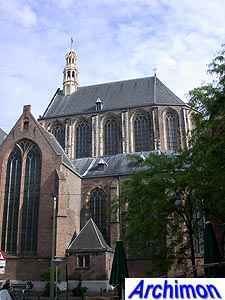 The St. Jacob was an important church, with close relations with the counts of Holland, the Stadtholders of the Republic and the royal family. 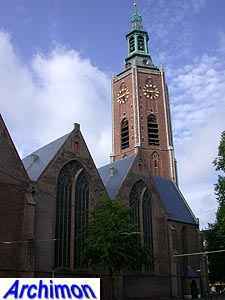 The tower is the oldest part of the current church; its construction was started ca. 1425. 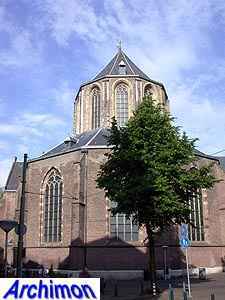 Its hexagonal shape is unique in this country, although related in style to several octagonal towers and tower segments in the province of Zeeland. Older pictures often show it with a cast iron neo-Gothic spire, which was added in 1863 and placed over the original spire. In 1957 both the original spire and the cast iron add-on were removed and replaced by the current spire, which is hardly an improvement esthetically, but probably a much safer burden for the old tower. 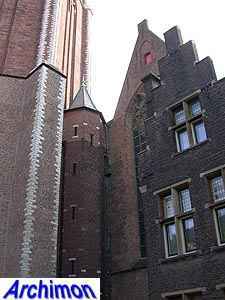 Although originally a cruciform church, an enlargement between 1434 and 1455 made the St. Jacob the first example of a new variant of Gothicism that became popular in much of Holland, but a few cases outside the county are known as well. 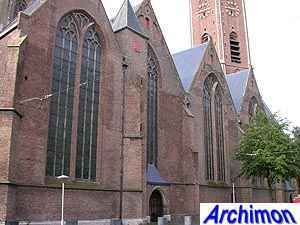 This variant is known as "Haagse hallentype" ('The Hague hall-type'), and is characterized by nave and side-aisles of equal height, with the side-aisles being divided in traves, each with its own gable and roof positioned transversely on the directon of the nave. These are only the most obvious outside properties of a new method that allowed the use of very large windows in relatively low buildings without the need for extra pillars. The use of wooden vaults made flying buttresses unnecessary, resulting in a very sober look both in- and outside of the church. 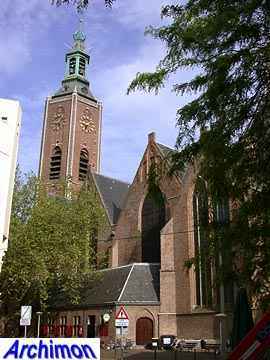 After a fire destroyed much of the building in 1539, a new church was build. This, the current church, is mostly a copy of the earlier church. The choir looks a bit like an afterthought, and from a distance even as a completely different building. 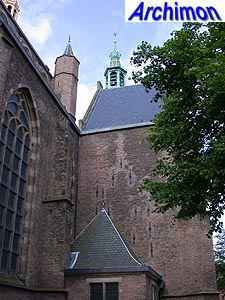 It's much taller than the nave, is crowned by a small tower itself and is in basilical style, as is evident from the ambulatory at its back. Although the ambulatory has stone vaults, the choir itself does not, which explains why flying buttresses are absent here as well, again resulting in a very clean appearance. On both its sides the choir is flanked by two rectangular chapels that together look like a transept. 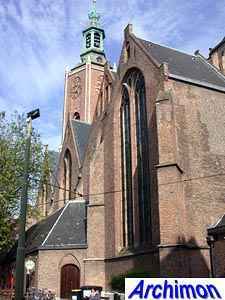 The actual transept is positioned just in front of the choir, but does not extent the width of the rest of the church.